It seems the holidays are all about the adults until Christmas morning when the kids get to open their gifts. It is the grown ups who do all the cleaning, cooking, shopping and other activities related to the holidays. The kids seem to just hang in the background waiting for the green light to get to those presents! While mom and dad are busy with the festive preparations, the kids can pitch in and help! Instead of store bought gifts or decorations, the kids can make some of their own. The ornaments we made this year were a big hit! You can get started now and be prepared for next year! Teachers, grandparents, aunts and uncles and other special people love to receive gifts made by kids. This year, Play-Doh has teamed up with Silver Dolphin Books and have come up with some cute books and activity sets. 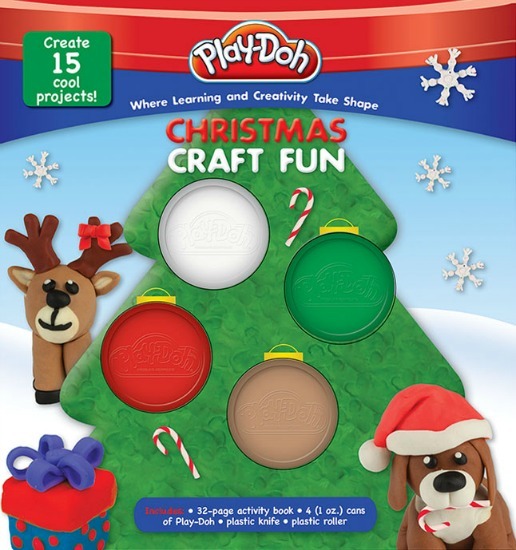 The Christmas Craft Fun book in the Play-Doh line has easy ornament crafts for kids which make great gifts. If there is two things kids love when they are younger is read fun books and create with Play-Doh. This classic kids favorite has a tagline which says it all; “Where Learning and Creativity Take Shape.” Just in time for the holidays, your kids can make some adorable gifts for your family as well as to share with others. Who does not love Christmas ornament crafts for kids to keep and share? It is so cute to see how proud the little ones are when they hand over their treasure and see the smile on the recipients face when the gift is open. Silver Dolphin Books have 3 super cute new titles filled with colorful images, fun stories and several craft ideas. They have included the classic Play-Doh in small cans, plastic shaping utensils and double-sided play mats. We received the 3 books, which are Christmas Craft Fun, Let’s Create: Letters and Let’s Create: Shapes. The Christmas Craft Fun is a boxed set with an activity book, holiday story, 4 cans of Play-Doh, and 15 holiday ornament and decoration projects. The Let’s Create: Letters books has Zany Zebra who will familiarize young kids with the alphabet and Let’s Create: Shapes take kids on a trip through town learning about shapes and pre-math skills. With the hands on experience provided in these books, kids are having fun while learning, which helps them retain the information better. I would love to have the PLAY-DOH: My First 100 Words: Animals book. I would like the PLAY-DOH: Let’s Get Creative. I would like PLAY-DOH: Mama’s Little Ducklings! I would love Halloween Craft Fun! I like the Letters ABC book. I like PLAY-DOH: Mama’s Little Ducklings. I like the Counting Bunnies book. I like the Rainbow Butterflies. My tot would love the Rainbow Butterflies! The Let’s get creative book looks fun. i would like the let’s get creative book. I like the Lets get creative. Let’s get creative would be my first choice and first 100 words. I think my daughter would like “Mama’s Little Ducklings”. I like My First Words. I really like the Let’s Get Creative Book. Thank you for the super giveaway opportunity. Keep up the terrific blogging. My First Words looks good. I would like Making Shapes with Monkey! I like PLAY-DOH: Counting Bunnies. What a great book to add to this year’s Easter basket. My favorite book is the PLAY-DOH: My First 100 Words: Animals! Counting Bunnies! Waiting for spring and Easter. I’d like to have the Lets Create: Letters! How fun! I would like the Halloween Craft Fun book! Which would I like? I would like Let’s Create: Letters because I am trying now to teach my grand daughter her letters and numbers. Like the PLAY-DOH: Making Shapes with Monkey. I would love the PLAY-DOH Jumbo Sticker Book: Let’s Get Creative for my son. I’d like the Making Shapes with Monkey book for my son. My first 100 words book. I also like the PLAY-DOH: My First Words. Making shapes with monkey is the book I choose! Besides the Christmas crafts, I’d love to have the PLAY-DOH: Halloween Craft Fun! I would like the PLAY-DOH: My First Words book. My son is practicing his letters, so I’d choose that one! I would like the book Making Shapes with Monkey because I am trying to teach my daughter her shapes right now, and she loves play doh, this would be great for her! The Halloween craft fun looks cool!! I’d like the Let’s Create: Shapes, we are currently working on learning those with my 2 1/2 year old son. Rainbow butterflies would be the one i would choose !!!! I want the PLAY-DOH Let’s Create: Letters: Where Learning and Creativity Take Shape. I would like PLAY-DOH: Halloween Craft Fun﻿. Let’s get creative: jumbo sticker book. Thanks! I like the “PLAY-DOH: Making Shapes with Monkey” book.